Our local Asian grocery stocks black soy beans, and I thought it might be nice to use them instead of regular black beans in a chili to make it lower carb. If you don't have black soybeans, you could use the more common white ones or even edamame (green soybeans). Soy beans are a bit more firm than most other beans, so to get them nice and soft it's important to first soak the dry beans for at least 12 hours and then cook them for about 90 minutes on low heat. If you have a pressure cooker, 45 minutes in there would be even better to soften them up. If you find canned soybeans somewhere, feel free to use those! 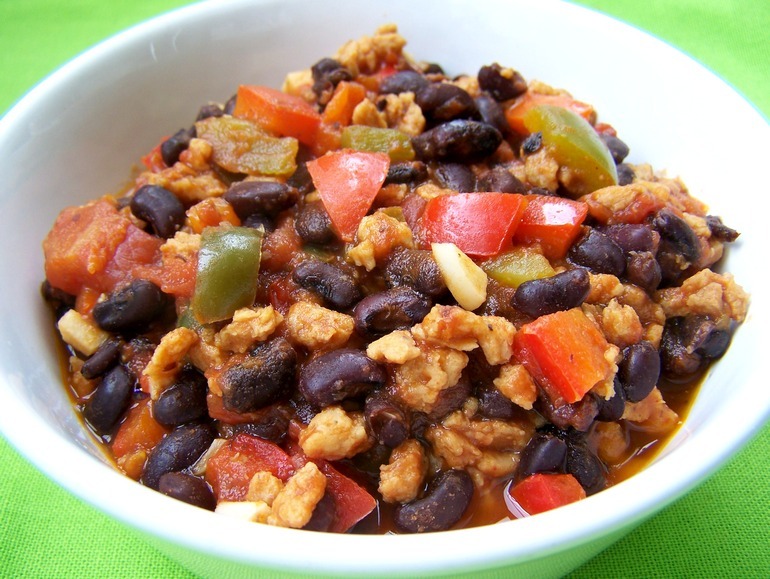 Serve the chili by itself or pack it into low carb wraps. It will taste even better with some sliced avocado and vegan cheese. First reconstitute the tvp. Put it into a small saucepan and add water until it is almost submerged. Add the soy sauce. Bring it to a boil and cook for five minutes until the water has been absorbed and the tvp is soft. Set the tvp aside. Heat the oil in a large pot on medium high heat. Sauté the peppers and reconstituted tvp for about five minutes until the peppers soften. Add the garlic and continue to sauté for another minute. Add the other ingredients and bring the chili to a boil. Turn down the heat and let the chili cook for 10 to 15 minutes. Season to taste with additional chili powder and salt if you want. One serving (1/4 recipe) contains about 350 kcal, 14 g fat (2 g saturated), 22 g carbohydrate, 10 g fiber, 28 g protein.